Ted A. Campbell, The Gospel in Christian Traditions. New York: Oxford University Press, 2009. Campbell shows in this book how a simple message embedded in the New Testament and handed on orally in early Christian churches has characterized historic Christian communities, including Orthodox churches and the Catholic Church, Protestant churches, and Evangelical churches as well. Click here to see this book on the web site of the Oxford University Press and to order copies of it. Campbell does not run away from the tricky hermeneutical question of whether the same phrases can have the same meanings in different cultural systems and his answer to the implied problem is that careful questioning and respectful dialogue can help the process of mutual understanding. Shared meanings are always imperfectly shared and once we have grasped the implications of that insight, then the talking can begin. This book should be read attentively by all those who are committed to ecumenical dialogue. – Nicholas King. 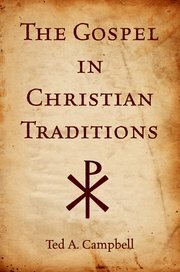 Click here to see an excerpt from Nicholas King’s review of The Gospel in Christian Traditions that original appeared in The Tablet (London).